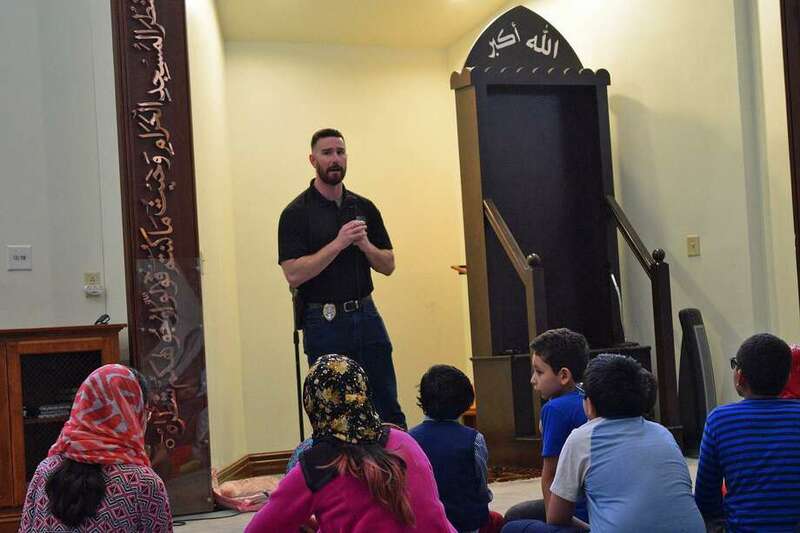 Detective Theodore Fuini of the Berlin Police Department leads an active shooter training session at Islamic Association of Greater Hartford mosque on Sunday, April 14, 2019. BERLIN — After shootings at two New Zealand mosques killed 50 last month, the Islamic Association of Greater Hartford staged active shooter training Sunday for members, according to NBC CT.
Berlin police detective Ted Fuini led the training at the association’s mosque on the Berlin Turnpike. The training was the same type of presentation the police department does at local schools and businesses, Fuini said. Some members expressed sadness that their children were questioning how to save themselves if a person came into the mosque to do them harm, NBC CT said. But mosque leaders also said it was an important conversation to have. The mosque has also hired a security guard and formed a safety committee, NBC CT said. “As soon as we heard about New Zealand, we were getting all of those emails and messages amongst the teachers and parents like how can we keep our kids safe?” teacher and parent Tasnuba Hoque told NBC CT.
“The mosque is trying to provide this training for all of the parents, all the teachers. So you know if there ever was a situation like this how to save yourself, how to save the students, all the other members of this mosque,” Hoque continued.